Thalys high-speed train . . .
What is Thalys? Paris to Amsterdam from €35, Paris to Brussels from €29! 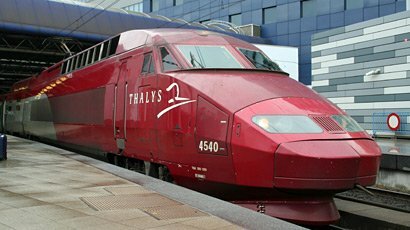 Thalys is a consortium of the French, Belgian & Dutch national railways formed to run the high-speed trains between Paris, Brussels, Amsterdam & Cologne. DB (German Railways) was originally a minority partner, but has now pulled out. 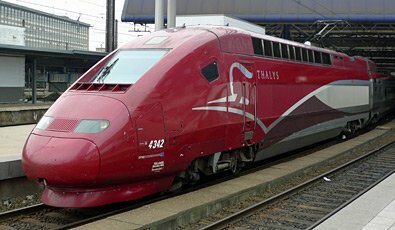 Thalys is faster than flying - Paris to Brussels in 1h25, Paris to Amsterdam in 3h20, Paris to Cologne in 3h20, city centre to city centre. 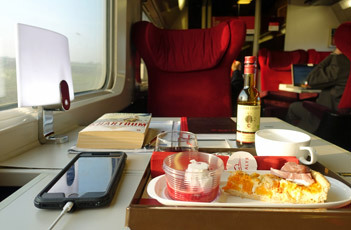 What's it like on board Thalys? 1st class seats, 2+1 across car width. Larger photo..
On 10 December 2017 Thalys switched from its previous two classes Confort 1 (1st class) & Confort 2 (2nd class) to three classes of service: Standard, Comfort & Premium. The trains will still physically have two types of seating which I'll call 2nd class & 1st class, but some 1st class cars will be designated Comfort and others Premium. 2nd class cars will be called Standard. You will choose your class when buying your ticket. Standard. 2nd class seating, access to cafe-bar car, free WiFi, power socket at seat. Standard fares = changes to your booking can be made for a fee, 50% refundable. Standard Mini fares = no changes, no refunds. Comfort. 1st class seating, access to cafe-bar car, free WiFi, power socket at seat. But no longer any at-seat food or drink included. Changes to your booking can be made for a fee, 50% refundable. 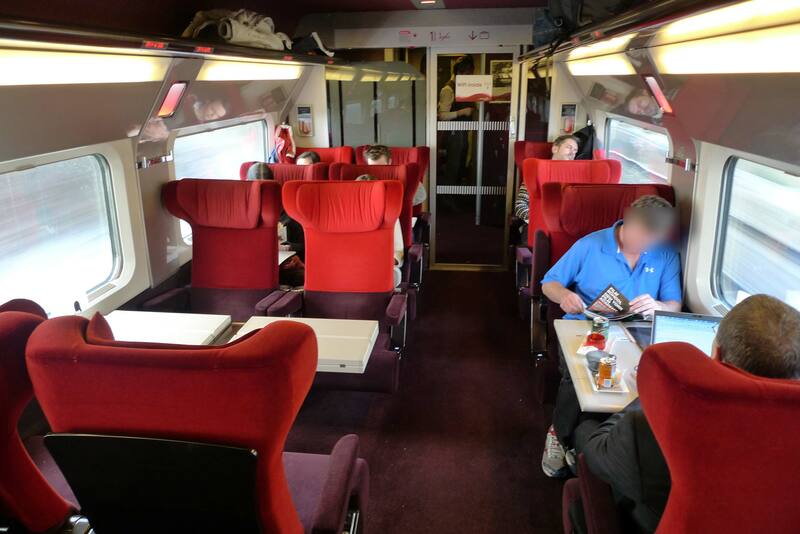 Premium: 1st class seating with meal & drink included in the fare & served at your seat, access to Thalys lounges in Paris & Brussels, cafe-bar car, free WiFi, power socket at seat. Changes to your booking can be made with no fee, 100% refundable. The photo of the food above shows the light cold tray served to Premium class passengers travelling between Amsterdam or Cologne & Brussels. A more extensive hot tray meal is served to passengers travelling between Amsterdam or Cologne & Paris. The new 3 classes are correctly & clearly shown when you book at www.thalys.com and www.b-europe.com but with other booking systems you may need to look closely at which 1st class you are in fact booking! Yes. 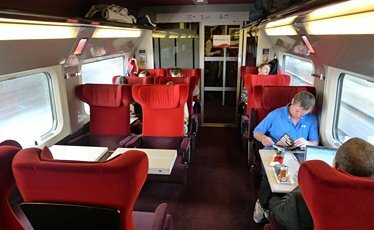 Like Eurostar, reservation is compulsory on Thalys and all Thalys tickets automatically include a reserved seat on a specific train. If you want to stop off it means buying two separate tickets. Thalys fares work like air fares, rising as the cheaper tickets are sold. So for example, Paris to Amsterdam starts at €35 booked several months in advance rising to a whopping €130 for a fully-flexible ticket bought on the day. So book as far ahead as you can. Booking usually opens 120 days before departure, although it can sometimes be less than this. How to buy tickets. 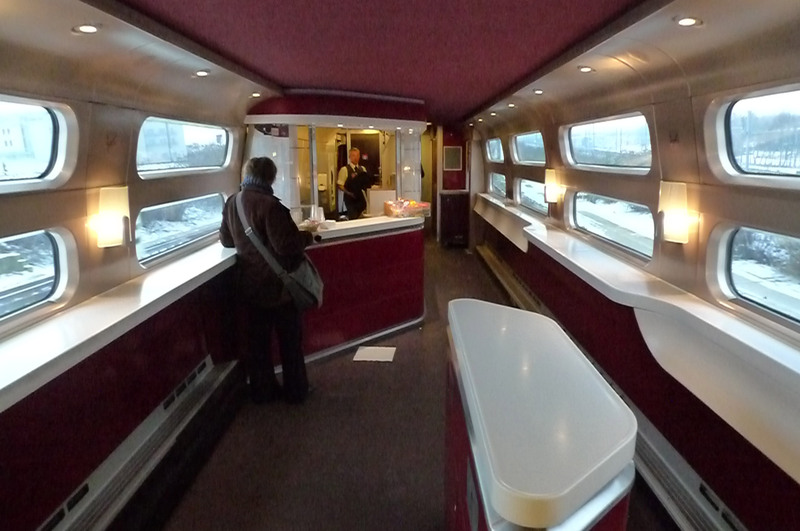 Thalys trains have 1st & 2nd class seating and a café-bar. Thalys call 2nd class Standard and it's perfectly fine for most people, there's absolutely no need to pay for 1st class if you don't want to. 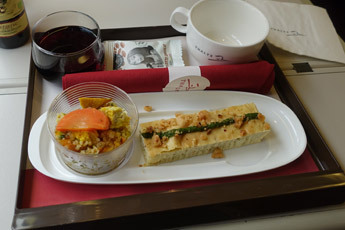 But if you don't mind the extra cost, Thalys has two types of 1st class, Comfort & Premium. Both types use the same 1st class seating with seats arranged 2+1 across the car width instead of 2+2 as in 2nd class, so as well as tables for 4 and dual side-by-side seats, in Comfort & Premium you'll find tables for two and solo seats on one side of the aisle. A face-to-face table for two is ideal for couples. Comfort just gets you the extra comfort of 1st class seats, although you can use the NS first class lounge in Amsterdam, Rotterdam & Schiphol. Premium is aimed a business travellers with expensive flexible fares, but a meal & drinks are included in the fare and you can use the Thalys lounges in Paris & Brussels as well as the NS first class lounge in Amsterdam, Rotterdam & Schiphol, see the paragraph about lounges below. Thalys trains are double-ended, with a power car & driving cab at both ends. The train could enter service either way round, so it's not possible to specify forward-facing seats on Thalys as the reservation system doesn't know which seats will face which way. But this is not a big deal on a smooth-riding train. Indeed, for a couple or a family, face-to-face seats around a table for 4 or a table for 2 are the best and most convivial option. 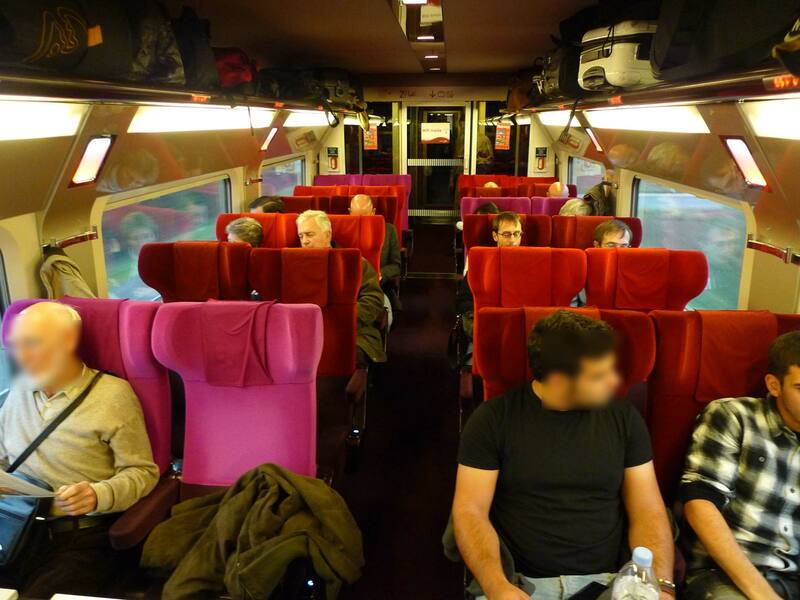 Seat numbering plan: Click here for Thalys seat numbering plan. Each Thalys train has 8 cars sandwiched between power cars, but sometimes two Thalys units run coupled together so cars can be numbered 1-8 in the first unit and 11-18 in the second. You take your bags with you onto the train and put them on the big racks near the entrance doors, or in the spaces between the seat backs, or on the overhead rack above your seat which will take anything up to backpack-size. All luggage must be labelled with your name. 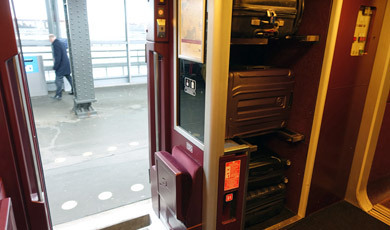 Unusually, in 2013 Thalys introduced a theoretical baggage limit of two large suitcases up to 32Kg and one smaller bag, or one suitcase up to 32Kg plus one bulky item (bike bag or skis, for example) plus one smaller bag, with prams & child buggies allowed in addition, but as no-one will measure or weigh your bags and as there is free access to the train with no-one to stop you, it's largely unenforceable and you needn't worry unless you're trying to move house by train! Politely remind staff this is a train, not a plane! More information about luggage arrangements on European trains. Left luggage lockers at stations. As with most European trains, there's no check-in, you just walk into the station, look at the indicator boards to find your train and get on, any time before it leaves. Doors may be closed a minute or two before departure. Since December 2015 in Paris & Lille there is a simple baggage X-ray, metal detector & passport check at the entrance to the platform. It should only take a couple of minutes, but when joining Thalys in Paris or Lille it's best to arrive at least 15-10 minutes before your train. It's largely security theatre to reassure passengers, there are no similar checks at other stations, other than a possible ID check in Brussels which may take a few minutes. Premium class fares include complimentary food & wine served at your seat. If you're only travelling between between Brussels & Amsterdam or Brussels & Cologne you'll get a light dish with wine, if you're travelling to or from Paris you'll get a more extensive tray meal. There is WiFi on all Thalys trains, now free of charge in all classes. There are power sockets for laptops & mobiles (2-pin, 220v) at all seats in all classes. Baby changing facilities are available in car 7, 17 or 27. There are special family areas in cars 6 & 7. Children under 12 are no longer allowed to travel alone on Thalys trains. If you have a Thalys ticket to or from Brussels Brussels Midi (= Brussel Zuid or Brussels South, they're all the same place), your Thalys ticket entitles you to connecting train travel to or from other Brussels stations including Brussels Central, Brussels Nord & Brussels Luxembourg on any normal Belgian domestic train. Brussels Central is only 5 minutes walk from the historic Grande Place. Brussels Luxembourg is the station closest to the EU Parliament. Trains run every few minutes. Folding bicycles and bikes in zip-up bike bags no bigger than 120cm x 90cm are carried, but not undismantled bikes. There's more detailed information at www.thalys.com. For information on taking bikes by train in Europe, see the bike by train page. Small dogs & pets in carriers no bigger than 55 x 30 x 30cm travel free, but larger dogs require a special ticket (not bookable online), see www.thalys.com for more details. UK travellers should remember that Eurostar doesn't take dogs, see the Taking your dog by train page for alternatives. Guide dogs go free on both Eurostar & Thalys. Wheelchair spaces are provided in car 1, 11 or 21, together with wheelchair-accessible toilets. There's more information for travellers with disabilities at www.thalys.com. If you have an InterRail or Eurail pass you must pay a special fare for Thalys. Paris-Amsterdam €25 in 2nd class or €35 in 1st, Paris-Brussels €20 in 2nd or €30 in 1st, Brussels-Amsterdam or Brussels-Cologne is €15 in 2nd, €25 in 1st. 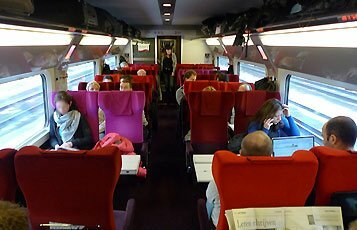 1st class meaning Comfort class on Thalys for passholders. This assumes your pass covers all the countries you will pass through. You can't make passholder bookings at thalys.com, but you can make them at www.b-europe.com without a booking fee as follows: Click Plan & book then InterRail train passes then scroll down to Book your Eurostar or Thalys pass fare now and click it. You are emailed your Thalys or Eurostar e-ticket. This method works whether your pass is an InterRail or Eurail pass, it doesn't matter. Passholder places are controlled by quota so it's not guaranteed there'll be any passholder places left at short notice, even if there are seats left on the train. Anyone with a 1st class international ticket can use the stylish first class lounges at Amsterdam Centraal, Schiphol & Rotterdam Central, with complimentary tea, coffee, soft drinks. Beer & wine for sale. Look for signs to the NS International (formerly NS Hispeed) lounge. First class railpass holders can also use these Dutch lounges. 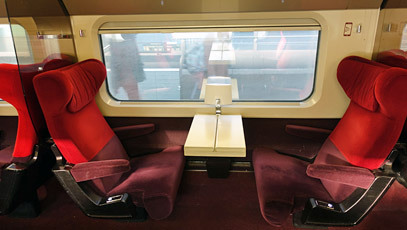 If you have a Premium class ticket you can use the Thalys first class lounges at Brussels Midi and Paris Gare du Nord. In Brussels, the lounge is outside the station, walk out of the main exit on the platform 1 side of the station and turn left, it's on the other side of the road almost at the end of that street, the Place Victor Horta. 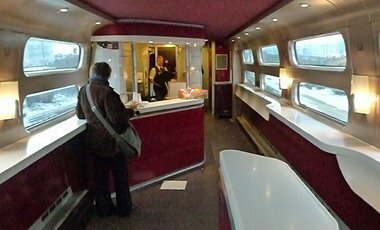 In Paris the Thalys lounge is in the rue de Dunquerque just outside Paris Gare du Nord, walk out of the station main exit and turn right along the station facade and beyond it across the road down the side of the station with the taxi rank in it. In Paris, the Brasserie Terminus Nord (www.terminusnord.com) directly across the road from Paris Gare du Nord is a great place for a meal, coffee or beer before boarding a Thalys to Brussels, Cologne or Amsterdam. Click here for two other great dining recommendations near the Gare du Nord. In Brussels, see Brussels Midi information here. 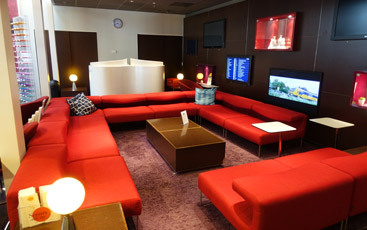 1st class lounges: Comfort & Premium passengers may use the lounges in Amsterdam & Rotterdam. This Amsterdam Centraal, on platform 2b. Luggage: It's easy - just bring your bags on board and place your suitcase on the racks. There's usually no problem finding space. Seating options: In Comfort or Premium, the best seats for couples are the face-to-face tables-for-two, known as Club Duo. Note the space for bags between the seat backs. I recommend www.b-europe.com to check Thalys times, prices & buy tickets. You print your own ticket. Anyone from any country can use www.b-europe.com, it's the official Belgian Railways international site which can sell tickets for any Thalys journey and also for journeys involving connecting trains such as Paris to Bruges, Bruges to Amsterdam or Paris to Koblenz. You can also buy through tickets between London and Amsterdam or Cologne using Eurostar+Thalys at www.b-europe.com. Booking usually opens 120 days ahead, although this often shrinks to as few as 60 days ahead for dates after the major timetable change in mid-December, and sometimes for dates after the mid-June timetable change too. You can also book at Thalys' own website www.thalys.com. However, this only sells Thalys tickets and won't book journeys involving connecting trains except through the Any Belgian Station arrangement. It's in fact a portal, which delegates ticket sales to the French, Belgian or Dutch railways sales systems depending where your Thalys journey starts, and occasionally the French and Dutch systems have been known to reject overseas credit cards. If you have any problems with Thalys.com, simply use www.b-europe.com for any Thalys journey. Yes, you can also book Thalys tickets at www.raileurope.com (for residents of the USA, in $), www.raileurope.ca (Canada, in CAD), www.raileurope.com.au (Australia, in AUD) just be aware that these sites may add a booking fee and may not give you any seating choice. That's why I recommend using www.b-europe.com. If you have a Eurail or InterRail pass, you need to pay a special fare for Thalys, see the Railpass paragraph in the Travel tips above.